Nordic Ware is one of St. Louis Park’s oldest and most successful businesses. Of special interest to the City is the company’s proximity to the last viable roadside park on Highway 100. It is an active member of the group that worked to preserve this historic site, and voluntarily maintains the site in the summer. The importance of Nordic Ware to our community cannot be overstated. 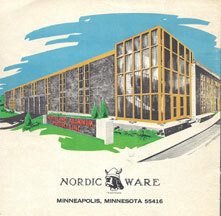 The company now known as Nordic Ware was founded by brothers Dave and Mark Dalquist and friend Donald Nygren in 1946. Their first business, capitalized with only $500, was called “Plastics for Industry,” and was headquartered in Mark’s basement in Minneapolis. They quickly outgrew this and then another space, and bought a 40 ft. lot in St. Louis Park. The lot was one of several at that location, and had a history of its own: apparently a man had inherited the property, but his accountant failed to pay the taxes, so it went up for auction. A former mayor of St. Louis Park bought the lots, and the company bought its first lot from him. They erected a small concrete building, beginning the Nordic Ware campus of buildings. The story is that there was no water along Highway 7 at the time, and they had to melt snow to make mortar. They moved into the building in the spring of 1947. The space grew exponentially, and now covers the entire frontage on the northeast corner of Highways 100 and 7. One of the properties they acquired was a lumber yard, and on that space stood the old Peavy grain elevator, built in 1900. 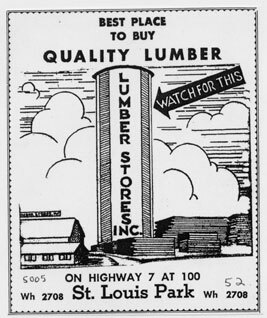 Nordic Ware replaced the words “Lumber Stores” from the tower and replaced it with its own Viking symbol, easily recognized today. Another parcel was once part of the Robin Hood Flour grain elevator, acquired when it was torn down in 1968. See Grain Elevators for more information and pictures. By 1948 their focus was changing to the products that they are best known for: cast aluminum bakeware and specialty kitchenware. Some of the first products included the krumkake iron and the rosette, ebleskiver, and platte pans. Maid of Scandinavia was set up to market these products by mail order. In 1949, the company bought out Northland Aluminum Products and the term “Nordic Ware” from Leonard Nordquist, and has been known as Nordic Ware ever since. Maid of Scandinavia began as a division of Northland Aluminum. 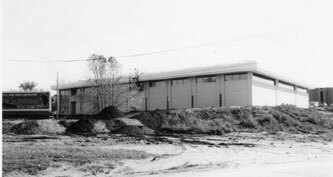 In 1962, the company bought Northland Color Anodizing Co. (later Northland Metal Finishes), and purchased additional property from the Renner Well Co. 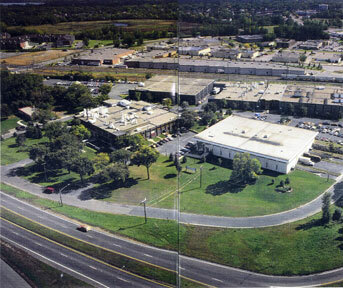 In 1964, Northland became one of the original 10-20 companies licensed by Dupont to use Teflon, and by the 1990’s it developed non-stick coatings that were used in medicine, computers, and even aerospace. In 1966, the company’s signature Bundt pan was used in a winning entry in the Pillsbury Bake-Off, and the popularity of the pan soared. David Dalquist had created the pan in 1950 based on the specifications of two Jewish women from the Minneapolis chapter of Hadassah, who wanted to make an old-world (German) bund cake. Bund meant “a gathering of people,” but other connotations led to changing the name to Bundt. The pan was only mildly successful until1966, when the Tunnel of Fudge cake, made with a Bundt pan, won the Texas Bake-Off. Bundt pans gave Nordic Ware the visibility it enjoys today, and the company has sold over 40 million of them. Starting in 1971, Pillsbury made cake mixes specifically formulated for the Bundt pan. Nordic Ware could hardly keep up with the demand for pans. On March 12, 1971, the company held a banquet to commemorate its 25th anniversary. Local television personality Stuart A. Lindman emceed the event, and guests included Mayor Ken Wolfe, who had printed their first catalog. In 1978, the company successfully manufactured the Micro-go-Round, a carousel used in the days before microwaves had built-in turning devices. For an in-depth look at Nordic Ware’s history, see the book The Nordic Ware Saga, An Entrepreneur’s Legacy, by H. David Dalquist. Founder H. David Dalquist was born @ 1917 and was a metallurgical engineer for US Steel in Duluth. He partnered with his brother Mark after serving in the Navy during WWII. He lived in Edina for over 50 years, and died on January 2, 2005. His son H. David Dalquist III, born in 1949, has run the business for many years. See also the article in the March 2007 issue of the Re-Echo.